Becoming a scientist is a very individual process and can involve different paths as we discover and combine diverse experiences and interests. Although the trajectory to becoming a scientist is something very personal, finding a way to merge our passions is one of the most important things that we can do to ensure professional success, especially in the sciences. This was the case for astronomer, graphic artist and photographer José Francisco Salgado. Dr. José Francisco Salgado's interest in space began thanks to a book about the first man on the moon, Neil Armstrong. Watching the stars as a child in Carolina with a telescope that his dad had helped him buy reaffirmed his interest in studying astronomy. "As an astronomy aficionado, I was going to Culebra with my 10-inch diameter telescope to see Halley's Comet or the movement of the astros" - he says. Encouraged by his parents and teachers, he entered the University of Puerto Rico, Río Piedras to study a bachelors in physics. After college, he participated as a physics and chemistry teacher in the town of Carolina, during which time he started to realize the importance of formal and informal science education. In 1992, he entered the University of Michigan-Ann Arbor to study first a masters, then a doctorate in astronomy. As part of his doctoral thesis work, he travelled constantly to Puerto Rico to collect data at the Arecibo Observatory. Although he was interested in pursuing a career related to astronomy, as graduate student he was still unsure about what path his career was going to take. His Eureka! moment came when someone from NASA gave a talk at Michigan about the importance of talking to the general public about astronomy. It was then that he decided he wanted to incorporate an outreach component in each of his research projects. His scientific training and research, combined with his efforts in science outreach, eventually earned him a spot at the Adler Planetarium in Chicago. The Adler Planetarium is a very particular astronomy museum that uses innovative approaches, such as theaters, telescopes, a planetarium and sophisticated technology, to study the space through formal and informal science education. For José Francisco, the museum has enabled him to use his graphic design skills and to recover and incorporate another passion he has had from childhood: photography. Jose Francisco’s passion for photography and his knowledge about the space, have allowed him to create a series of videos for the planetarium that present space in an interesting and appealing way through the use of visual media. When asked how an astrophysicist manages to combine photography with science, he says that "people who are responsible for disseminating images of stars have a point of view and an artistic sensibility similar to that of the scientist". With this concept in mind, he has created pieces that have been accompanied by various musical soundtracks, such as the Chicago Sinfonietta, the Boston Pops Opera, the San Francisco Symphony and the National Symphony Orchestra of the Czech Republic, among others. Among the material that he has covered in videos, he has made projections of the Gustav Holst planets. In addition, he was the moderator of Our Galaxy (Nuestra Galaxia), a tv segment in the Chicago Univision news, which earned him an Emmy nomination in 2006. In 2009, one of his films served as the opening video for the International Year of Astronomy (IYA 2009), which commemorated the 400th anniversary of Galileo's discoveries at the United Nations Educational, Scientific and Cultural Organization (UNESCO,) in Paris. His videos have been presented over 75 times around the world, in over 14 countries, and have been seen by over 150,000 people. Motivated by the interest generated by his videos, José Francisco recently embarked on two projects that have allowed him to continue combining music, photography and astronomy: the nonprofit organization KV265 and the project Bailey-Salgado. The mission of the KV265 organization, founded in 2010, is to inspire an appreciation for the understanding of the sciences employing or making use of art. Among KV265’s most notable projects, is the creation of Science and Symphony, which is a live staging of high-definition science videos accompanied by a symphony orchestra. For the Bailey-Salgado Project, José Francisco and the British musician Tom Bailey, combine videos of space with new musical compositions which are in most cases performed live by Bailey. 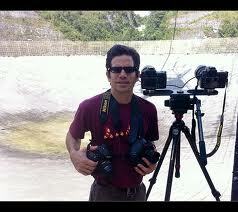 During the presentations, José Francisco will intervene to explain scientific concepts relevant to the videos. The creative process behind the videos is very collaborative and organic, and the use of electronic music allows them to take different directions to give more impact to the scenes. José Francisco’s passion for observing and studying space, and for photography, music, and education have served as a vehicle for him to reach the public. While he may have originally lacked a master plan when deciding to study astronomy, all his passions have gradually fell into place. Although his work is multidisciplinary, he admits that science gave him the tools and training necessary to achieve a successful outcome. He believes that, when he conceptualizes his work, he thinks with the rigor and precision of a scientist, and that his training allows him to ensure that the content in his videos and pictures is correct and accurate. In addition, the creative process that he goes through is logical and self-aware and allows him to discern between art and reality. In both aspects of his life, both the artist and the scientist, he seeks to tell a story. "Designing an experiment or making a discovery is an art, and art can also be, at times, a kind of science". Therefore he says, "we must not abandon what we love, but seek to combine it". His biggest challenge has been to "find a niche where you know that you can contribute with your talent, since there are people for whom talent (only) does not make them happy. If during graduate school I had not found that ‘something’, my future in science perhaps would have been different". However, now that he has synchronized his interests with his career, he greatly enjoys each day. Whenever he has the opportunity to create and start inquiring from scratch (like when he had to read about the life of William Herschel- who discovered Uranus), it is his scientific training that guides him. His greatest satisfaction, in addition to creating, is the intrinsic desire to express himself and present science to the public in a concrete and accessible manner. In the near future, he plans on collaborating with various musicians and scientists from other scientific disciplines to create a portfolio that covers a variety of scientific topics. His first venture outside of astronomy is a project called Music and the Brain. This project presents functional magnetic resonance imaging (fMRI) recordings performed on two classical harpists from the group "Beyond pluck" as the play. The documentary, which features the music of the two harpists as soundtrack at the same time that a group of neuroscientists explains and interprets the fMRI information from the artists, was presented at the American Society of Neurosurgery. José Francisco, accompanied by these two young harpists, will be presenting this video during Sacred Heart University’s (Universidad del Sagrado Corazón) Festival of Sciences in Puerto Rico next March. When asked if he thinks that the concept of scientific careers in STEM (Science, Technology, Engineering and Mathematics) should be revised and re-conceptualized as STEAM (Science, Technology, Engineering, Arts and Mathematics), he answers without hesitation: "Of course!". In fact, he thinks that communicating science to the public through art allows a broader reach and impact. "To be creative, you don’t need to necessarily deviate from the research process, rather by applying creative art skills, you may in fact discover much more." To learn more about Dr. José Francisco Salgado, visit his webpage or read his CienciaPR profile.